In December 2004, the Chicago Film Archives acquired a collection of amateur films and documentation from Chicago movie-maker Margaret Conneely. Conneely (1915-2007) was active in amateur filmmaking both locally and internationally for nearly half a century. In the 1950s, Margaret’s films won awards from major amateur contests in both America and Europe, and by the 60s she had become a highly regarded competition judge, attending amateur film festivals around the world. She wrote articles on amateur film that appeared in local club newsletters, the Journal of the Photographic Society of America (PSA) and even the New York Times. 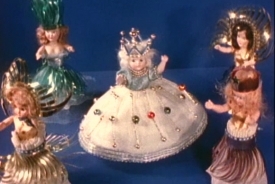 Fairy Princess (1956) was Conneely’s most successful amateur film, winning a slew of local awards, and being named one of the Photographic Society of America’s “Ten Best” films of 1956. Conneely’s film was also awarded the PSA’s “Harris B. Tuttle Trophy”; named after Eastman Kodak’s innovator of the 16mm format, this trophy was awarded annually for the best amateur storytelling film on a family theme. 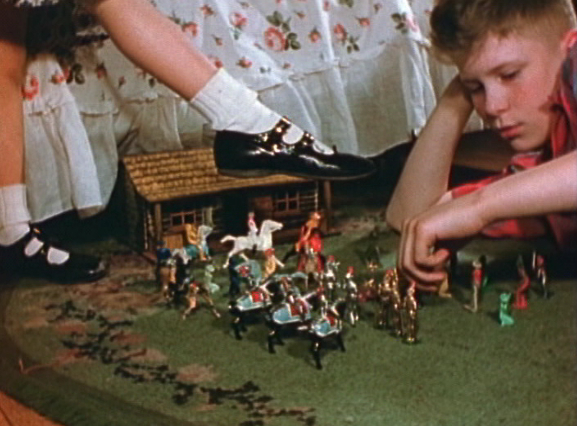 Conneely’s vivid Kodachrome film stars her niece in a Christmas fairy tale. 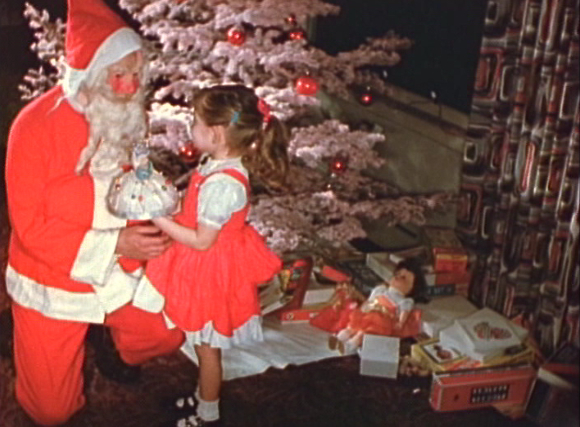 Though it includes shots of this little girl sitting on Santa’s knee and asking for a doll that really dances, this is no mere ‘home movie.’ The film shows little Linda doing her chores and being good, in hopes of being rewarded for her efforts. 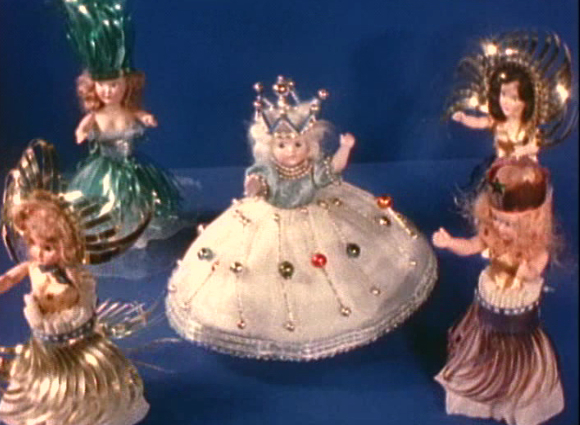 On Christmas morning, Linda discovers the doll she was promised; at first it seems like just a normal toy, but then, animated through stop-motion, it goes through a series of dances and transformations. 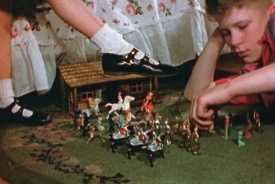 The film concludes with Linda putting her doll to bed, satisfied with the reward for her many good works. Fairy Princess is interesting on a number of different levels. On one hand, it presents us with a fairy tale of 1950s childhood and domestic life, reproducing a parental fantasy of good behavior and holiday bliss. But the film is also a remarkable work of craftsmanship. 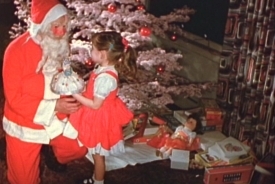 Conneely’s film isn’t a rough assemblage of Christmas home movie footage; it is a carefully staged, edited and narrated labor of love. Employing stop-motion animation and a careful mix of music and narration on its mag-stripe sound track, Fairy Princess displays a surprising amount of technical sophistication. The mid-1950s marked the beginning of a new era for amateur filmmakers as the pioneering Amateur Cinema League dissolved and the Photographic Society of America’s Motion Picture Division became the world’s largest amateur organization. With support from the National Film Preservation Foundation and a collaboration with Colorlab in 2005, the preservation of Fairy Princess will help fill an important piece of this historical narrative by providing an excellent example of award-winning, post-war amateur filmmaking. It also demonstrates the active participation in organized amateur filmmaking by women, illustrating the craftsmanship, subject-matter and inventiveness that characterized their work.